Fredric March won an Oscar for his portrayal of Dr. Henry Jekyll — and the bestial Mr. Hyde — and deservedly so. His portrayal of Hyde as a barely-restrained beast is correct. Hyde is a literal monster in human form, unrestrained anger, lust, and desire. He also portrays Dr. Jekyll very well, as a man of science who is caring, compassionate, and somewhat obsessed with expanding human knowledge. And a man who is deeply in love with his fianceé, and wants to marry her. The other actors all do a fine job. When Miriam Hopkins acts terrified of Hyde, it seems quite real. It’s frankly what one would expect from an abused girlfriend, who’s afraid of triggering the abuse. And she has the scars to prove it. Likewise, Holmes Herbert as the best friend does a fine job of trying to pull Jekyll away from his self-destructive path, once he knows. And the audience feels the character’s regret when he points out his best friend to the police in the climax. I’d also like to say something in appreciation for the transformation sequence from Jekyll to Hyde. This is a black and white movie, and the special effects crew used that to their advantage. By painting blue makeup on Fredric March’s face, and filming with a blue filter, all seems normal. Until the blue light fades, and the makeup appears. A very clever technique, that avoids the ‘transition’ effect until the end of the movie. 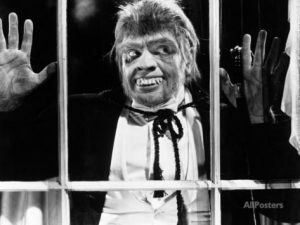 Dr. Henry Jekyll/Edward Hyde (Fredric March, I Married a Witch) – the nice, kind, upright young doctor, who believes that there are no boundaries that science shouldn’t pass. He is wrong. Ivy Pearson (Miriam Hopkins, Trouble in Paradise) – the pretty young singer at a bar, rescued by Dr. Jekyll after an altercation with her boyfriend. And who later catches the fancy of Hyde. Muriel Carew (Rose Hobart, The Mad Ghoul) – Jekyll’s loving, faithful fianceé, who never doubts his goodness and sincerity. Dr. Lanyon (Holmes Herbert, The Invisible Man) – Jekyll’s best friend, and in a real sense his conscience. The man who tries to pull Jekyll back from the abyss. Brigadier-General Carew (Halliwell Hobbes, Gaslight) – Muriel’s father, who doesn’t see what Jekyll’s rush to marry his daughter is about. A stiff, elderly man who loves his daughter, and is willing to die to protect her. Poole (Edgar Norton, Son of Frankenstein) – Jekyll’s faithful butler, one of the most likable characters in the movie. Fredric March won an Oscar® for playing the protagonist (and antagonist) of Robert Louis Stevenson’s story. Dr. Henry Jekyll is an honorable man of science, albeit frustrated at the enforced celibacy of a delayed wedding date. Hyde is the fearsome creature he turns into after drinking a potion, and Hyde’s appetites (mostly expressed with Miriam Hopkins’s Cockney dance-hall wench) are decidedly unrestrained. March’s performance is pretty theatrical, but it’s fun to watch; his Hyde twitches and squawks and lopes around like an ape in a tuxedo.